How do you pick where you live? Every time Alex and I get home from vacation, we want to move. We long to live somewhere with cleaner air, maybe even a beach to run on with the dog. Somewhere you can comfortably walk to town from your house or apartment, where the car is less important than it is in suburban Sacramento. Our wish list goes on– less heat, more connection with the outdoors, you get the picture. But does this place exist? Yes, I’m certain it does, but not without trade-offs. It probably costs more than Sacramento, not to mention that our jobs are here. The irony, is that we already had much of what we were looking for when we lived in Berkeley, minus the right jobs. Walkable urbanism, nearby coastline, no need for a car until it was time to drive back to Sacramento to see family. But, therein lies the catch. We, or as my husband likes to point out, I, wanted to come back to Sacramento all the time for family events. My family is big and close, so there is always something worth coming home for. Eventually, we realized we could live in a house in Sacramento and not drive back and forth all the time for the same price as our tiny North Berkeley apartment. We also recognized that life was pretty much the same in Berkeley as it is in Sacramento– jobs, dinner, exercise, sleep, weekends. However, ironically, we traded friends for family returning to Sacramento, as most of our close friends have now migrated to the Bay. This trade in itself is alright, family should come first, but the idea that life is the same wherever you live is a partial truth. In the big ways, it is mostly the same, but in little, surprisingly important ways, it’s different. We miss walking to the grocery store, running in the Berkeley hills to stare out at the Golden Gate Bridge instead of people’s unwatered lawns. Jumping on BART to be in San Francisco, arguably my favorite city on earth. Our weekend jaunts to the Pelican Inn, only forty minutes to enjoy the ocean. So many things, really. And, to be fair, there were also downsides: expensive rent, earthquakes, small/noisy living space, mentally ill bums defecating outside our front door… Alright, Berkeley was not perfect either. I get that life is trade-offs. You pay more for less in places that are most desirable. You leave behind family and/or friends to chase different priorities. But something makes me sad about prioritizing where I live above my family. Then again, something makes me sad about not being able to comfortably breathe the air in the city where I live, at least in summer. Don’t get me wrong, Sacramento has plenty of aspects worth appreciating, but the smog and sprawl really crawl under my skin. Three years into our return, we’re at a precipice. I want to spend one more year with my same students, as I loop fourth and then fifth grade, but after that, we’re thinking of leaving again. For where, I’m not sure. Carmel (more likely Salinas/Monterey/Santa Cruz), Portland, Ashland… The list is just beginning to form. But, I have this feeling, that no matter what, I’m giving something up. Either proximity to my family or those other things I value. My mom chose Mt. Shasta, my dad lives in Sacramento. It’s in my blood to be torn. The compromise, of course, would be to stay but try a different neighborhood, which is something we’re thinking about doing in the interim. Small neighborhoods, like East Sac or Midtown, show glimmers of those things we like, but we’d likely have to rent instead of own, at least to have anything comparable to where we live now. And, it would still not fix the smoggy air or stifling summer heat, let alone the lack of ocean. No, not all of California is on the beach, (too bad, really). I want to know, what have you picked in life? The familiar? The different but far away? How have you coped with the compromises inherent in any of these choices? Or, did you hit the jackpot– all the friends and family you could wish for in your ideal place to live? I want to hear about your experiences as I think through my own future choices. At the end of the day, I know happiness exists wherever you let it, but other places still call to me, particularly those places with crashing waves. 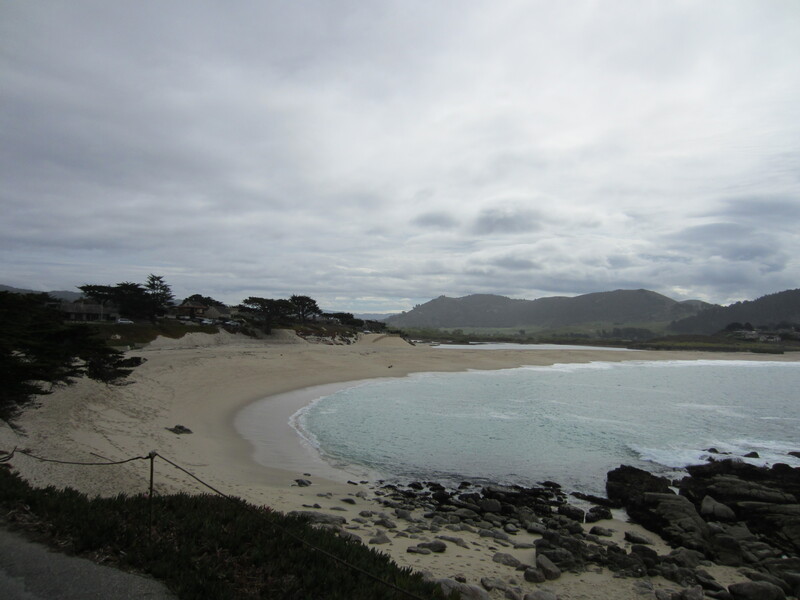 I think my first choice of places to live would be somewhere near Carmel (above), but my husband favors even rainier places like Portland or Dublin, (yes, really). Above all, I find myself drawn to the sea. This is a subject that is often in my thoughts, and I’m sure you’re probably not surprised to see my comment. Although I definitely believe in our ability to make our own decisions, I do sometimes find myself thinking that maybe the way we grew up influences us more than we think. When I was young, my parents relocated our entire family from New Jersey (hold the jokes, please) to Williamsburg, VA. Then to Texas. Then to Colorado. Meanwhile, their families remained in New Jersey and southeastern Pennsylvania. Finally, when I was 14 years old, the combination of an enticing job offer and missing family caused them to move back to Pennsylvania. A consequence of all this (and I’m sure one that my parents didn’t anticipate given their disapproval) was that when I was ready, I moved from Pennsylvania, home to all of my family and most of my friends, to Northern California, which I had only visited once. Which brings me back to your question – why? The answer is the same as my parents, and when really boiled down, the same as yours: a better life. The difference between us is the criteria we use to define “better”. For me, the job opportunity played a part, but what I really sought was nature, beauty and the great outdoors, all within range of a dynamic, interesting city. Boom – the Bay Area it was, and I certainly haven’t regretted my decision. The culture fits my personality; I get to hike and wine taste and eat at fantastic restaurants; and I met my husband and many wonderful people (including yourself, Olivia). Of course there are trade-offs – the very high cost of living chief among them. And so Kevin and I find ourselves at the same precipice; with our definition of “better” shifting with our life choices, will another location fit the bill better than Berkeley (previously San Francisco – see we’ve already adjusted!)? If you stumble upon a magic calculator, into which you plug your values, daily routine and future plans, that spits out the perfect place to live, please pass it on! For now, we’d like to keep the things we like most about the Bay Area – access to nature, good people, lots of things to do – and couple it with the ability to afford a home of our own. Up to now we probably sound like heartless, selfish pragmatists with no regard to family. Don’t get me wrong, we love our families and we look forward to going home each year at Christmas and receiving family visitors throughout the year. But the truth is, (and I can only speak for myself on this point, although I believe Kevin feels the same way) I can achieve happiness keeping close relationships with my family over the phone and with occasional visits. Yes, I will always feel like I’m missing out and yes, I will miss them terribly throughout the year. But I don’t think I would be able to achieve real happiness if I couldn’t live the daily life I want, and I was never able to live that life while I was in Pennsylvania. Although my sisters are currently in the process of spreading their wings and moving away from the nest, both Kevin and I’s parents live very near each other, so we receive a lot of pressure to move back. And who knows? Maybe our priorities, and definition of a better life, will change someday and we will go back. My parents did. But for now, you can expect to find us somewhere in the Wild West: most likely, California, Oregon or Colorado. Beautifully put, seriously. When is the rebirth of your blogging going to happen? 😉 I relate so much and hear my own struggles in what you described. I love the Bay Area for the same reasons, and miss it sometimes too. Fortunately, we come back a good amount, which helps. Maybe we’ll all end up in Oregon! PS. I like what my cousin said once. He pointed out that manifest destiny and the push west is in our blood. Many of us are nomadic by nature. I would love to end up in Oregon – so gorgeous, and I’ve only seen a small sliver (though I’ve loved living vicariously through your recent travels). My dad actually found a job opportunity in Beaverton, and let’s just say, I’m being *very* supportive of his going after it. And you’re right, I need to start writing again. While typing my previous comment, I felt the urge quite strongly. I’ve been keeping a private journal of recent life stuff, but as soon as I return to the public forum, I’ll let you know! One consequence of my weekend experience in Downieville is that I want to push this, I want to find a way to make this dream of mine come sooner instead of later. I hope it all works out, particularly the writing a best seller! It’s just funny how some places feel more conducive to writing than others. May your hard work and patience pay off. I ❤ you and that you get me. No matter what, I'm still here now! We lived in Santa Cruz for a few years and we loved it more than we could have imagined. Even now, when we go back to visit, we both get a little teary because it feels like home. Still, we moved away because we couldn’t afford to have a family and lived there and having kids won out ultimately. We moved back to Sacramento to be close to family (a blessing and a curse). We have talked about moving away again, but Sacramento isn’t a bad place to live because it is close enough to the places that we really would love to live that we can visit them frequently. If you want to go, GO! You can always come back. Or not. Adventures are always a good idea, though. The first few times I moved it was at the whims of someone else- my parents, later my ex, who was transferred every two years. I craved the stability of staying put for a while. I’ve had my wish granted for the past fourteen years, living in Jacksonville. I’ve enjoyed living here, but I’ve developed a keen wandering foot. My new husband and I have talked about leaving the state, but we are still waiting for our kids to finish high school. In the meanwhile, I dream of living in the mountains, or Savannah, or Charleston, SC. Anywhere it seems, but here.